HURFOM: Three people have been injured by landmines in Yebyu Township in a one-and-a-half-month period from October 15th to November 29th 2018. The blasts have taken place in Kyaung Shar Kwin area, A Lae Sakhan village, Yebyu Township, Tenasserim Division, which is a mixed-controlled area between the New Mon State Party (NMSP) and the Karen National Union (KNU). According to Nai San Tin, the A Lae Sakhan administrator, a private from the NMSP, a 30-year-old Han Gam resident named Min Mon Chan, and a 33-year-old A Lae Sakhan resident were injured on October 15th, October 28th, and November 29th, respectively. “A [couple] week[s] before the A Lae Sakhan resident was injured [by a landmine], a villager experienced a landmine explosion on November 10th. He was not injured, but his motorbike was damaged. The 33-year-old villager is from my village. The landmine was buried in his plantation and he was injured while working,” said Nai San Tin, the administrator. With the landmine blasts in October, residents feared working in their plantations and local villagers stopped work for two weeks. However, after the NMSP stated they had negotiated with the KNU, plantation workers returned to their plantations. However, shortly after, another villager was injured by a landmine. “The villagers are the ones who have to suffer. But we don’t know who planted the landmines. When a villager is injured [by a landmine], everyone is afraid, and no one dares to go to their plantations. All A Lae Sakhan residents have their betel nut plantations in Kyaung Shar Kwin. We’ve filed a report to the government authorities, but have had no reply yet,” said Nai San Tin. 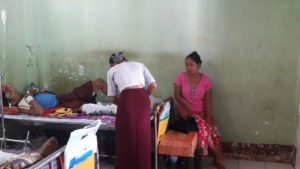 Nai Ba Lai who was injured on November 29th suffered a broken leg and was admitted to the Ye City General Hospital, but later transferred to the Mawlamyine General Hospital due to the severity of his injuries. “After a Ham Gam villager was injured [by landmine], we didn’t dare go to the plantation for two weeks. But the NMSP said they had a negotiation with [the KNU]. So, we started going back to work again. He stepped on a landmine while removing grass around the betel-nut seedlings. I was beside him when the landmine exploded,” said Mi Kao Soon, Nai Ba Lai’s wife. She continued that she did not know who planted the landmine but that the landmine destroyed her family’s life. As her husband had kidney surgery last year, she had no money for the medical cost and said she had to sell her house to pay for the treatment. “In the past, when the KNU wanted to use our plantation to build a road for wood production, we willingly gave our land. We also provided them with vegetables from our plantation. And how they brutally treat us like this when we’ve been good to them. If they also want the plantation, I’ll give it to them. But it’s not good to injure people,” said Mi Kao Soon. While Nai Ba Lai suffered a severely broken leg, the two other landmine victims both had a leg amputated during treatment, leaving the question of how they will earn a livelihood and cope once they have recovered. “They had to cut his leg off, and his wife also has a chronic illness. He has to stay at his mother’s house. He also doesn’t know what to do after his leg has healed. It’s difficult for him to do his work. His livelihood will be different than it was in the past,” said Nai Yoe, an elder brother of Min Mon Chan. Because of land disputes between the NMSP and the KNU, the two sides have clashed often near A Lae Sakhan village, leaving villager’s fearful of entering their plantations over the question of landmines. It remains unclear who planted the landmines in the Kyaung Shar Kwin area plantations.